This soul food favorite is one of the most interesting and delicious dishes around. Some are hesitant to try this unique concoction, but once they do, they love it for all its sweet and savory goodness. The exact origin of chicken and waffles is unknown, but the dish as we know it today has roots in how it was served in Harlem, New York, as early as the 1930s. 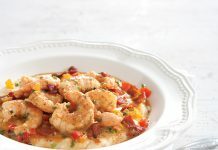 Creativity is aplenty when it comes to this hearty meal, and these restaurants dish up flavorful takes on this iconic combo that you’ve just gotta try. 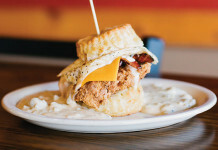 The menu at Dame’s Chicken & Waffles lives up to its name with a seemingly endless number of creations—each featuring a different type of chicken, waffle, and “shmear,” which is a sweet crème butter whipped with natural ingredients to create unique flavors. The What a Classy Hen? features a chicken cutlet, a classic waffle, and a vanilla and almond shmear while A Quilted Buttercup is made with a chicken cutlet sandwiched between sweet potato waffles with a maple-pecan shmear. The Orange Speckled Chabo—with a chicken cutlet, sweet potato waffle, orange-honeycomb shmear, and honey Dijon drizzle—and the Frizzled Fowl—with a panko-crusted chicken cutlet, a classic waffle, blueberry shmear, almonds, and plum sauce—offer even more flavor, and the Dueling Roosters, made up of four wings, a classic waffle, two shmears, and calypso sauce, brings the heat. 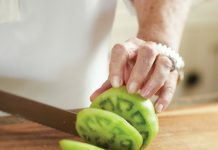 Included on the menu of modern, inventive cuisine at South City Kitchen is a brunch item guests won’t want to miss. 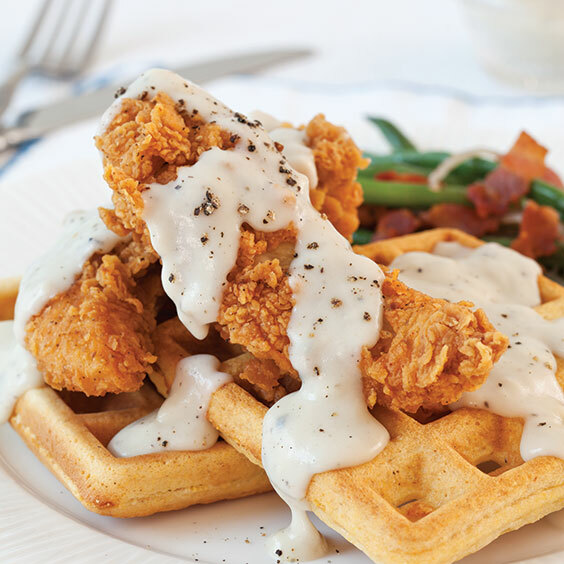 The Springer Mountain Farms Fried Chicken & Malted Buttermilk Waffle served with pure Vermont maple syrup lets the quality of their signature fried chicken, buttermilk waffles, and rich syrup truly shine.